Why did I think using bells with fans so naturally? 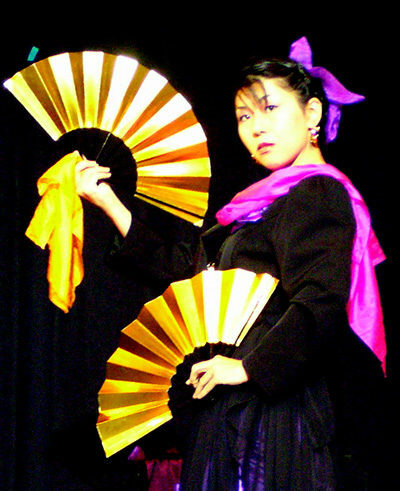 The idea came from a traditional dance which is called “Mikagura”. I was learning Japanese folk dance which was called “minyo”, when I was a little. Please note, it is not “Classical Japanese dance” which is known as traditional Japanese dance to foreigners. Such a Classic dance is called “Nihon-buyo”, you have to pay a lot of money to learn it. And also have to have expensive kimonos for it. In the other hands, “minyo” is song about ordinary people’s life. The move of the dance mostly expresses their works at a fields or fishing grounds. The fee of learning “minyo” is not so expensive and the costumes doesn’t cost much to buy or rent. Most of the kids in the “minyo” class were not from a very wealthy family. Once in the year, we had a recital of “minyo”. At the end of the show, we performed “Mikagura” as a finale with whole class members. “Mikagura” is a dance for dedication to the god, originally danced in a shrine to express thanksgiving for a plentiful harvest. People ring bells, which is called “kagura-suzu”, and spin a fan dynamically with the sounds of drums. The moves are reflected in my act. By the way, I didn’t know when I was a in the “minyo” class, but a “kagura-suzu” is a very expensive prop. You know, the kids were not from very rich family. So their parents might think hard to find a substitute item.